This is one of the easiest games in the world to play, as well as being one of the fastest and most fun! Each player gets 10 dice of the same colour and once ‘go’ has been shouted you throw them down in the first roll. Pick on one of the numbers and then proceed to scoop up your remaining dice to throw again. Keep removing the same number from play until all your dice match!! The more players the more amusing and exciting it becomes! With several different variations to play, there’s never a dull moment when someone gets the TENZI out. The Splitzi version involves collecting two numbers, whilst Stealzi causes the most argument as players steal the number they want from their opponents! This is a perfect game for kids to play. It helps to teach them fast decision making as well as assisting their hand to eye coordination. Dexterity is an important ingredient of game play, as is pattern recognition if you’re going to be the winner! 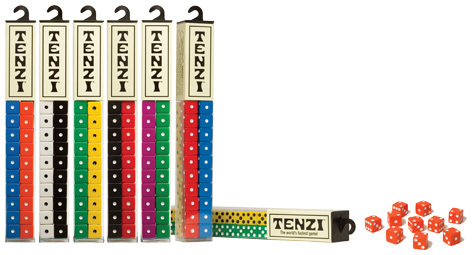 Each tube of TENZI contains 40 dice in four different colours and more different coloured sets can be added for extra players. Following a 2014 Eddy Award from the US Educational magazine, TENZI was quickly snapped up by the astute people at Coiledspring Games who have exclusive distribution rights in the UK. Check out their fantastic ranges of games and jigsaws, many of which can be played by the whole family. Simply enter your name and email address below and you could be walking away with this prize when we select the winners at random on Friday 17th October 2014. Good luck! Please tell us what you think of the TENZI by Coiledspring Games.